As I was scrolling through the High Tech contest entries, I had to chuckle when I saw this photo. I took the same shot just weeks ago and it has been my computer wallpaper for the last couple of days. Here I am looking at your picture on one monitor and my picture on the other. Excellent shot! Thank you very much to have a look for my photo. I was visiting Kennedy Space Center. A dream has come true. The most facinating thing at the exhibition beneath the space shuttle Atlantis and the Saturn V rocket, was this original capsule from Apollo 14 named Kitty Hawk. It was started at January 31, 1971. The astronauts Alan B. Shepard and Stuart A. Roosa were landing at Fra Mauro for almost 34 hours before coming back to the mother ship with astronaut Edgar D. Mitchell, who was waiting in orbit for them. 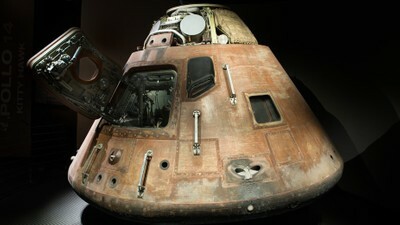 After 216 hours they landed in this capsule in the pacific ocean at Febrauary 9, 1971 safely.